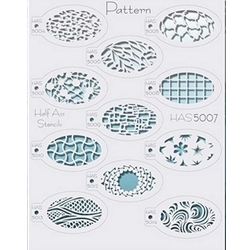 These airbrush stencils are available in two different prints: Patterns and Organics. Each stencil card includes 11 different stencil designs that measure approximately 3.3" x 2" each. Airbrush stencils are a great way to take your makeup design to the next level by adding intricate detailing that generally isn't possible with traditional makeup application.